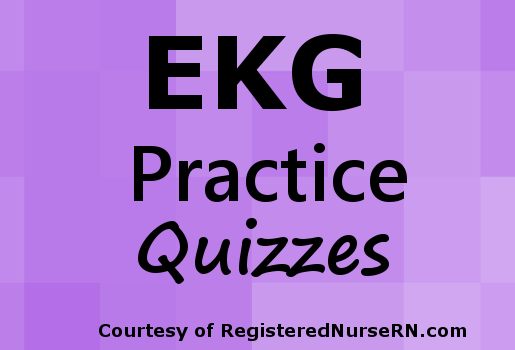 This EKG rhythm practice quiz will test your knowledge on the different types of atrioventricular heart blocks. These AV heart blocks include: AV 1st degree, Mobitz I (Wenckebach) 2nd Degree Type 1, Mobitz II 2nd Degree Type 2, and 3rd degree (complete heart block). In nursing school and as a nurse you must know how to tell the difference between these rhythms. This ECG practice test will help you differentiate between the rhythms. Don’t forget to review the heart block review notes before taking the quiz. The figures below are part of the quiz for you to identify each specific rhythm. NOTE: After you take the quiz, the page will refresh and you will have to scroll to the end of the page to see your results and the answers you got right/wrong. 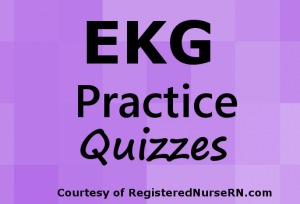 This EKG quiz will test your knowledge on AV heart blocks, such as AV 1st degree, Mobitz I or Wenckebach (2nd degree Type 1), Mobit II (2nd degree Type 2, and 3rd degree AV block. It really helps a lot. Thank you very much. I appreciate your comment! Thanks for letting me know it helped you! I am a medicine resident and i must say that this tutorial is really nice especially for beginners .